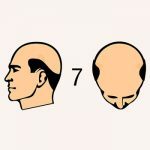 A scale used to identify the stage of hair loss in males, there are seven levels or stages of hair loss in the Norwood Scale. Should you consult with the hair loss experts at GetHair, we can help you to understand what level of hair loss you’re currently experiencing, but it’s still a good idea to understand how far your hair loss has progressed so that you can consider all the treatment options available to you. 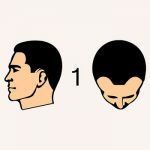 In order to understand your hair loss level it is important that you know what Norwood scale is and how to read it. This level doesn’t necessarily denote male pattern baldness because most males find that their hairline recedes slightly with age. Seek consultation to find out for sure. 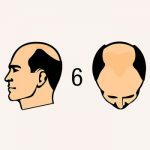 If you’re at this level of hair loss, it’s almost certain that you’re experiencing male pattern baldness, however, you may simply be genetically predisposed to temporal recession. If you seek treatment at this early stage, there’s a very good chance that you can regain most of the hair that you’ve lost quite affordably. 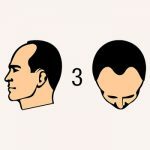 A slightly more advanced level of hair loss, there are two further types – 3A, in which the crown thins but doesn’t recede along with the rest of the hairline, and 3 Vertex, which also entails a slight bald spot appearing on the top of the scalp. A moderate loss of hair, but still treatable with hair transplant therapy. Like Type 3, there’s a Type 4A, which entails further thinning at the crown. 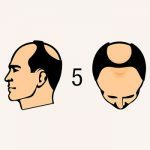 Type 5 and Type 5A are a continuation of the hair loss described above. By this stage the hairline has receded noticeably and there may also be a noticeable bald spot appearing on the top of the scalp. Further receding of the hairline and a prominent bald spot, with the hair on the sides of the scalp still remaining fairly high. By this stage the only treatment that will have any effect is hair transplant therapy. Whilst the hairline may continue to recede, this is usually the most severe stage of hair loss because the hair on the sides of the scalp will have mostly disappeared, leaving only a wreath around the sides. By this stage, hair transplant therapy is the only treatment option, but it will be difficult to regrow a full head of hair due to the severity of the hair loss. As one of the top hair transplant specialists in London – all treatments are performed in Istanbul,Turkey by our surgeon with more than 18 years’ hair transplant experience – we can help you understand the level of baldness that you’ve progressed to and advise you of the options you have available. Get in touch today to learn more about FUE hair transplant therapy.